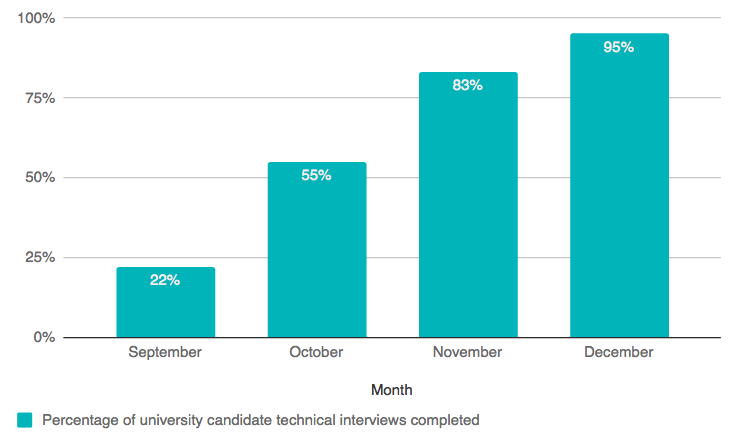 University recruiting: Leading tech companies will complete 55% of their technical interviews by October 31st. Are you on track? Career fair at Penn State. Source: Penn State Student Affairs. University recruiting season is a stress test for your recruiting and hiring engine. Your recruiting team and software engineers will need to conduct hundreds or even thousands of technical interviews in just a few short months. Right now you might be optimistic, but still wondering: are we going to reach our recruiting targets? According to Karat data, 55% of technical interviews should be complete by the end of October in order to reach your fall recruiting targets. Karat data shows clients have completed 55% of fall technical interviews by Oct. 31st. Not on track? Consider these best practices. Leading tech firms like Intuit are reaching their university recruiting goals by assessing candidates from more schools, skipping the resume screen, and enabling students to schedule directly with their interviewer. In the past, their university recruiting teams relied solely on their senior software engineers to do the first-round technical interviews and onsite interviews. By partnering with Karat and a network of professional interview engineers, they have been able to reduce the burden on their senior software engineers and ensure a much larger percentage of their new hires are recent grads from a variety of schools. Read on to explore three best practices for reaching your recruiting targets this fall. 1. Interview more candidates from more schools (and create more diverse teams). Competition for university tech talent is increasing in intensity year over year, yet most companies only recruit from 20 schools. On average, companies only consider about 6 schools to be target schools. The result isn’t just a narrower talent pipeline and stiffer competition, but it’s also a more homogeneous team. To interview candidates at dozens of schools, consider enlisting professional interview engineers to conduct first-round technical interviews. This will remove bandwidth constraints on the number of students you can interview and improve the chances you’ll meet your recruiting targets. This will also help your company assess candidates from a larger number of schools, from a wider variety of backgrounds, ultimately creating more diverse and innovative teams. 2. Skip the resume screen. Candidates appreciate speed: according to a 2017 CareerBuilder survey, a delayed hiring process was the number one reason new grads turned down job offers. Consider speeding up the process by eliminating the resume screen altogether. Sifting through paper resumes, trying to decipher feverishly scribbled notes on the backs, and then reaching out to those students one by one can take days — and another company might be faster than you. Avoid this delay by moving all candidates immediately to the technical interview. Doing this will not only save your university recruiters’ time, which they can use for other relationship building programs, but it may uncover talent in places that were previously overlooked. 3. Let the student schedule directly with their technical interviewer. The back and forth between recruiter and student to schedule an interview can be arduous — and yet another major delay. It is dependent on availability and responsiveness. If another company’s team is faster than yours, or has a more recognizable brand, the lengthy interview scheduling process can cost you candidates. To decrease the overall duration of the technical interview process, consider letting the student schedule directly with their technical interviewer. To speed up the process even more, allow candidates to schedule their interviews 24/7. Our data show that this can reduce the duration of the technical interview process by as much as 60% — gaining a significant competitive advantage. Making these changes to your university recruiting process can help you achieve more of your recruiting targets this year. It will also help you gain a competitive advantage next year by being prepared to start early with an efficient process that can interview students from more schools, reduce strain on internal resources, move at a much faster pace, and provide an exceptional experience for candidates.